Darling these are amazing. Can you imagine them pinned to a wall in large numbers. Might be really cool. Or as a hanging light. Hmm. Might be dangerous. Abuse away I say. Lovely. No doily doubt at all...they are beautiful (abuse? no...repurposed). I've been (nicely) accused of vintage sewing pattern abuse but I still don't believe it's true. oh my goodness - they are absolutely lovely!! I gasped (in delight - not horror) as soon as I saw them!! Found your blog through SF Girl bY the Bay. Love your blog. Especially love those beautiful portraits of your kids! They look really lovely - a very imaginative idea! 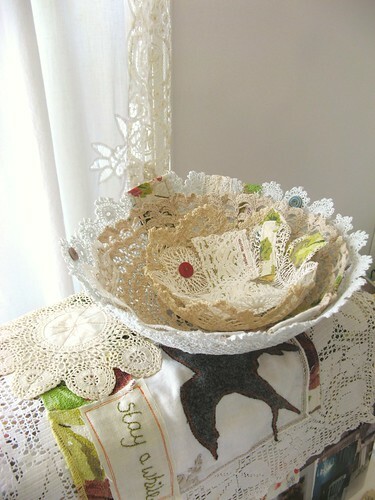 all of the doilies and lace i used have been rescued from bins and shelves in thrift shops. which fate is worse, being reused for something useful and beautiful, or sitting in a smelly old shop? i am not telling anyone to use their grandmother's doilies to make bowls or embellish notebooks (although a frame would be a nice tribute! ), but--if after i pass away my handiwork ends up in a thrift shop, i would be honored for someone else to come along and make use of it. I don't usually do doilies myself - but those are amazing, truely!!! What a fab little idea for a funny little dust gatherer. You are so full of great ideas. They are lovely! I can see them used in all sorts of delightful ways. How ever will you package them? I finally opened my etsy shop and I am full of trepidation. ohhh, so pretty :). 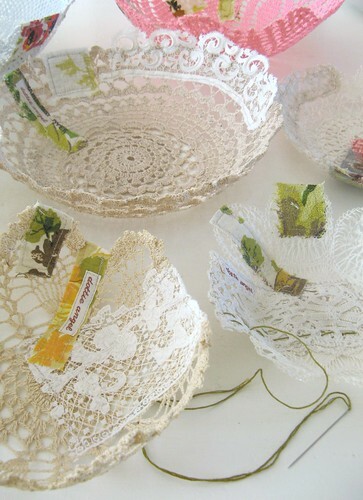 I have seen doily bowls done before but they usually look kind of funny, these ones are perfect! How can using something (that is a dime a dozen)in a Beautiful way that releases it from the realms of a musty old Hope Chest be considered 'wrong'???? my mom used to make these ... they're wonderful. I think these are so beautiful. Wow! You are so clever. You amaze me every day. 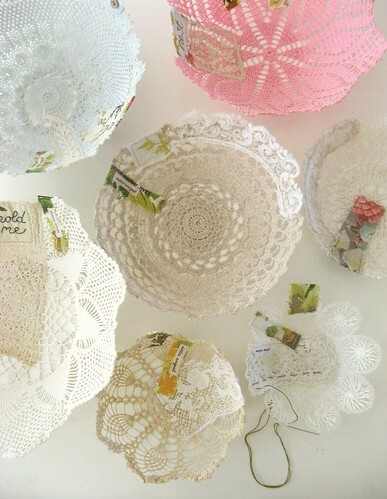 Have no doily doubting fears at all, these are gorgeous! 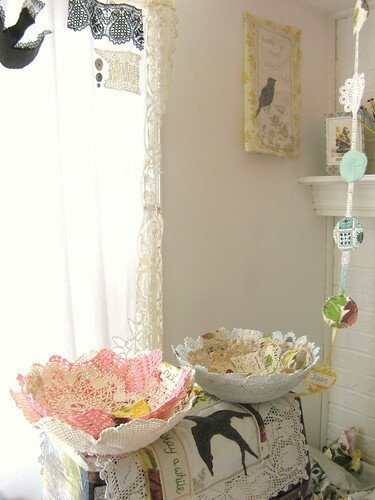 I think it's not the doilies you are doubting, but your own creative self. I am long convinced that you do not know how to abuse a doily. The bowls are so pretty. I love the Dottie Angel touch to them--it adds so much. Katherine put it so well. I saw similar dishes in my French mag, and went through the same doubts as you, but frankly, it's re-purposing - what's the problem? And yours look better than the ones in 'Avantages', anyway! Love them! I have seen them about before but I love the twist you have put on them with your Dottie Angel touch. Might have to research how to! if abuse created those, call me an enabler. seeing them all together is delightful.. great pics. heeheehee - how could i be expected to resist? So many lovely posts I've had to catch on, I don't know quite where to start? Think I am just exhausted over thinking about your challenge and joining you! I've just posted about it today. Thank you for such inspiring posts and challenges. Oh my Goodness - these are genius! I LOVE them!